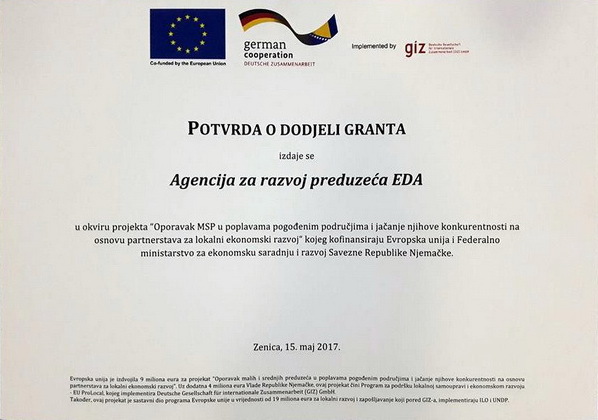 At the ceremony organized within the joint EU and German Government Programme for Local-Self Government and Economic Development in BiH – EU ProLocal, implemented by GIZ, Eda was awarded grant certificate for the project ‘KRIN – Creation of Regional Innovation Network’. The ceremony was attended by H.E. Ambassador Lars Gunnar Wigemark, Head of EU Delegation to BiH; H.E. Christiane Hohmann, Ambassador of the Federal Republic of Germany to BiH, representatives of the Ministry of Foreign Trade and Economic Relations of BiH, Federal Ministry of Development, Entrepreneurship and Crafts, RS Ministry of Industry, Energy and Mining, as well as grantees. The KRIN project – Creation of a Regional Innovation Network is co-financed by the European Union within the joint programme of the European Union and the German Government for local self-government and economic development in BiH – EU ProLocal, which is implemented by GIZ. The project budget is 233.795 BAM co-financed by the European Union in the amount of 186.498 BAM. The project contributes to improved competitiveness of SMEs in sectors of metal and wood processing in local communities Prijedor, Kozarska Dubica, Gradiška, Laktaši, Prnjavor, Derventa, Banja Luka, through networking of key stakeholders and solving market failures. The project budget is 233.795 BAM co-financed by the European Union in the amount of 186.498 BAM. More information about the project is available here.